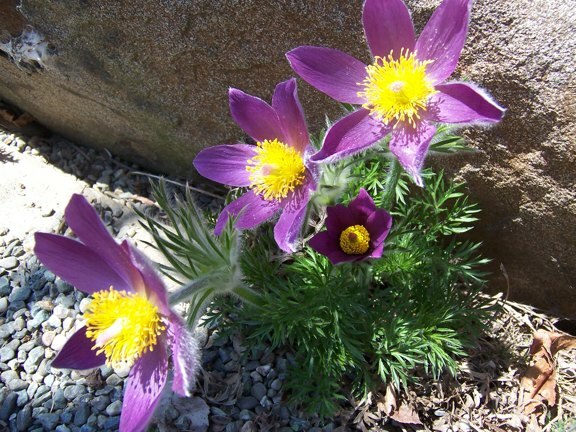 This gorgeous Pasque Flower offers a dramatic note of renewal in the garden right now. Spring is a time of new beginnings and not just for Flowers. For staff goddess, Jane Taupier, this new beginning has taken the form of a new enterprise that will deepen our understanding of ourselves as well as help us use Flower Essences in a particularly beautiful way. Jane has studied each Green Hope Farm Flower Essence in relationship to these issues. She is now ready to look at your astrological chart for you and make suggestions for Flower Essences that would support you in this astrological balancing process. You can ask for support on just one specific issue in your chart such as balancing your moon sign, sun sign or elements or you can ask Jane to study your chart and current transits to come up with Flower Essence suggestions or a mix for the whole enchilada. She has taken particular interest in which Flower Essences will enhance and strengthen each moon sign, as she feels Essences are particularly attuned to lunar energy. If you give Jane your date and time of birth and location, she will look at your chart for the information you desire. Prices for these readings will vary according to individual requests, but having availed myself to her wisdom, I can promise you that you’ll get your money’s worth. To get the ball rolling, you’ll need to contact Jane on email and chat about what you would like. After you have worked out the practical details, Jane will do a reading for you and make her suggestions. Then you can decide if you want to get back to us at Green Hope Farm to get any of the Essences Jane has suggested. Here is my photograph of her beautiful logo. 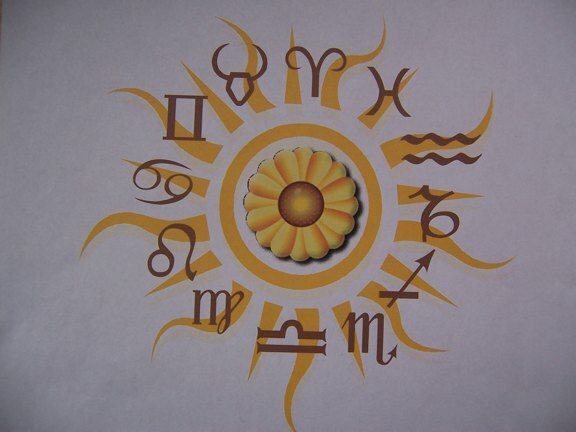 It has been a joy to experience the way Jane connects astrology to Flower Essences. I am so delighted that she will now be sharing this gift with all of you. Here’s a visual for you. Me running around the forest with bowls of water, sprinting from tree to tree seeking swift blooming, swift fading elusive tree blossoms. My children firmly believe, and with some evidence, that when I am immersed in a good book, they could detonate a nuclear weapon in the room with me AND I WOULD NOT NOTICE. But when it comes to things like blossoming trees or the Flowers of tiny weeds, I am all over the noticing thing. And this is a good thing, because with the fast action photography growth brought on by our recent extended spate of hot weather, I need to find the blossoms and make the Flower Essences pronto. It is an serious understatement to say the Flowers are coming and going very very fast this spring summer. For a long time, my children did not appreciate this skill set . So what if I could sit next to a table of strangers in a restaurant and know nothing about them when we got our breakfast menus, yet know their names, life histories, and dietary restrictions before our pancakes were served. It was sort of like my laugh. I have a distinctive laugh. Now don’t go thinking it’s piercing or a horse’s whinny. It’s a nice laugh. I don’t cringe when I hear it on tape or anything, but it is, as I said, distinctive and I do like to use it. This meant that during their teenage years, my three elder children found my laugh a problem. If we had to share a space for some event, say an auditorium for example, they wanted me to take a vow of silence. So too with the stalking. If someone they knew walked into a restaurant where we were eating, let’s say a former romantic interest I had never meet, I was forbidden to turn around and look at said ex. I was not even allowed to go to the bathroom so as to take a look. Checking the ex out in any restaurant mirror was also a no go. Things have changed. Things have changed. And frankly, I love it. In part, I credit this lovely sea change to the fact their lives have cut them off from excessive doses of entertainment TV. Steady employment will do that too you. Plus two of them don’t even have TVs. Suffering from this dearth of entertainment news has left them a bit more interested in actual people. It has made my curiosity in the human race seems a little bit more legit. I even am getting street credit for my data gathering skills. Suddenly, they want to study at the feet of the master. And yes, that would be me. I am quick to tell them it is not all a bowl of cherries, but sometimes the stalking really is better than Perez Hilton. For example, the other day I was in line for a table at our favorite breakfast joint. The woman in front of me sported a grape sized diamond and spoke to her attentive friend about her recent trip to visit her in laws to be at their country estate in England. Think castle. I certainly did. The woman with the rock hardly came up for air and neither did I as she shared the dish about her country weekend. In a flood of detail, unequaled by even a Jane Austen novel, I got the serious scoop on Gosford Park 2008. Sadly, Jim, Will, and I were seated just out of earshot of her lovely BBC vowels. I could only wonder what further raucous details I was missing as she kept up a steady stream to her friend from the beginning of our pancake breakfast to the end. While this was a peak moment, I suffered one of the typical casualties of stalking only this Saturday. I was in the check out line at an enormous used book sale with about thirty people ahead of me. I settled in for some quality stalking and was rewarded by a conversation in front of me between two old friends. However, when the talk turned to why one of the women’s husbands had given the book sale a miss, I was miffed by what she said. This is the heartbreak of stalking. Since I wasn’t an official part of the conversation, I had to stifle said comment and instead keep my best blank and disinterested face on. I felt badly for the people who were attending this man’s workshop hoping just to get information about what a blog is, not somebody’s pretentious, editorial comments. This overheard conversation made me glad, very, very glad that when I first heard the word blog it was because my stalking skills had begun to have some appeal to my children. I first heard about blogs from Ben who heard about them at a meeting with his former job, the ceramics sculptor. One of the axioms of stalking is that even at a meeting, even at a meeting that you are attending by default, why, even at a meeting that defines the word boredom, you may learn some interesting stuff if you just hang in there and pay attention. This particular meeting was with a big time internet guru, somebody who invented something to do with email while at MIT, somebody who when he invented this thing had professors invest on the spot and then take the student out to copyright the thing right then and there. Ben had been dragged along to the meeting and could easily have nodded off in the background. But no, he had begun the long rewarding journey towards master stalkerhood and he paid attention at the meeting. And what happened was the internet guru told Ben’s boss that blogs were where everything was going. While Ben’s boss did not seem to find this of any interest, Ben had year’s of my example of listening for juicy nuggets, even at things like business meetings and lines at book sales. Ben knew he had stalker gold and because he is nothing if not a generous soul, he shared this gold with his muuuuuther. I had seen the word maybe once or twice in a knitting magazine, but wasn’t at all sure what it was. A social faux pas? Ben kept at me. For weeks he blog bugged me. I am nothing if not initially very resistant to new technologies while later finding myself to be a total convert. Think email. Think ipod. I started reading blogs. I fell in love with a lot of them. They were a natural for a person who loved knowing about other people’s lives, but who didn’t get out much. Running the farm and all doesn’t always leave as much room for stalking as I would like which is probably why I am so FOCUSED when I do get a chance. Blogs fill in the gaps. They are not bad news like most media or at least the blogs I like aren’t bad news, unless you consider knitting goofs or culinary disaster bad news. Plus, they are always there. No ear strain and such good juice. I love blogs! So if you are out there blog stalking Ben, consider this my heartfelt thanks for getting me rolling. You may have studied at the feet of the master, but like any good student, your skills have surpassed the teacher’s. The Magnolia has burst into blossom with its pool of Bloodroot Flowers beneath. overstuffing my tiny greenhouse with baby plants. This climate is not the one of my childhood. Even after thirty years dug into these New Hampshire hills, I remain startled by the intensity of the transitions from season to season. 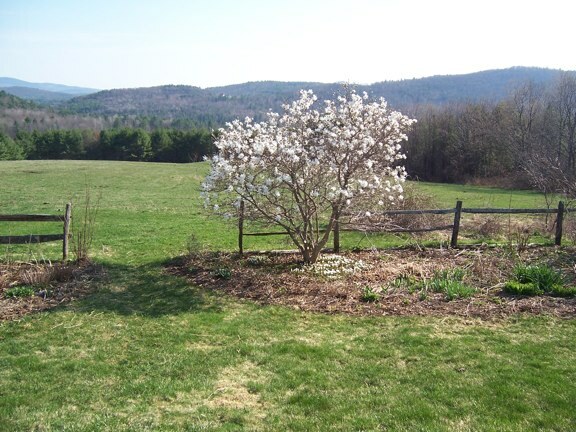 Spring was more mellow in the southern New England climate of my childhood. Spring was a lingering parade of happenings. Each day from late February to May was marked by a new arrival be it velvety Pussywillows or outrageous Forsythias or steadfast Lilacs. Here, all the guests appear to arrive at once. When the weather makes its annual abrupt turn from bitter winter to near summer, the place goes from moribund to mayhem in… well… three shakes of a lamb’s tale, maybe two. One day this week, the last snow pile, snugged up against the cold north wall of the bottling room, dissolved into a sullen gray mass. The next day, in the face of temperatures floating into the seventies, it was gone. 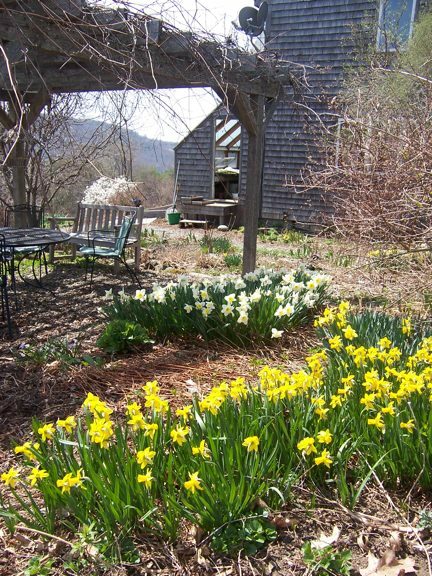 Only last week, it felt daring for the Daffodils to poke their foliage above ground. Today they are blooming in great waves across the gardens. But like the more leisurely parade of my childhood Springs, this Northern New England full throttle greening is best savored in lingering moments. Knowing that SLOWING DOWN is the best way to savor Spring and also beginning to actually LIVE this way is the grace of gardening in my fifties, as opposed to gardening in my twenties, thirties, or forties. Then I was one with the whirlwind. Now, not so much. Yes, I still need that memo to self, but surprisingly, not as much as I needed it, even last year. As I begin to spend more time each day in the gardens, I am surprised how happy I am to move slowly and do less, to pick the smaller tool for the job not the speediest, or to feel contentment with what is versus what could be. This is new territory to me, but I like it. I appreciate that the gardens can flourish with this lighter touch, because of the wild enthusiasm of my earlier decades with my ambitious plantings of six zillion plants sunk in multiple tons of compost and manure. I am grateful to gung-ho Molly of old, but I am also happy not to be her anymore. Sometimes the speed and scope of my efforts in early years weren’t just about loving every Flower I met, but also reflected a sort of perfectionism. I saw garden problems where perhaps there were just pauses in between acts. I went into overdrive to resolve what I saw as flaws in the garden designs instead of maybe just taking a time out myself. Now I get to enjoy the fruits of all this frenzied activity. I feel for my younger self both gratitude and compassion that she worried so much. The gardens turned out so much better than I imagined possible. These days, I can’t even remember what was bothering me then. There is so much beauty. Most mornings find me in a sweet, slow ramble, looking at each moment unfolding in the gardens with such simple gladness and delight. Grace surprises us in its forms. This contentment is a big piece of unexpected grace. 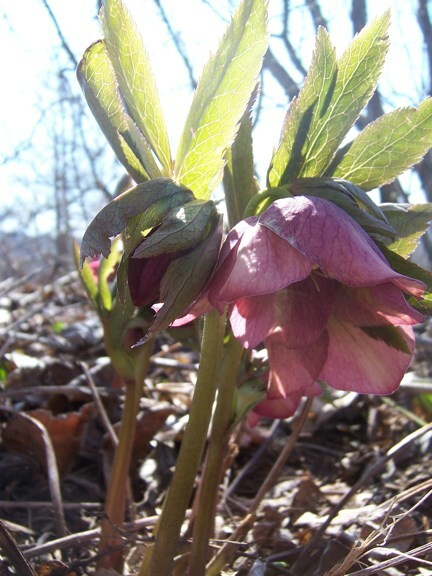 As is the arrival of the Hellebores. Just a few days ago they lay flat to the earth in a sort of tired looking heap of last year’s foliage. Now their Angel leaves and Flowers rise up expressing and sharing the pure joy of being. And I answer, yes, being is enough, more than enough. Yes, its Spring. I know how you feel about Spring. LIke you are going to burst with joy. That’s all very well and good, but I thought maybe it would be a help if I went over some of the ground rules for the season that might just save you from, well, doing what you do so well which is TOO MUCH. Here is a pep talk lecture to bring a touch of sanity to your favorite time of year. 1. 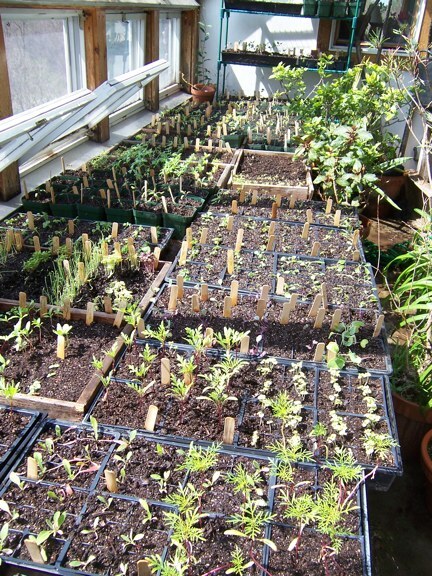 When the greenhouse is full of seedlings, it is full. Try to resist the temptation to start more seed flats. As in, STOP NOW. The greenhouse is full. Make the Grounding Flower Essence combination mix your best friend right now. It will help you to not get ahead of yourself or the size of your greenhouse. And try some of your new Desert Essence Purplemat. It is all about knowing that LESS really is MORE. 2. Last week you and Jim had a cup of caffeinated coffee together. This led to a very ambitious plan to build a new garden shed, renovate the present garden shed into storage space for inventory and then, once the inventory is all moved out of the barn, renovate the downstairs of the barn into a ping pong palace. That is a big enough project for the summer the century. If you actually do meet up again for a conversation together this season, lay off the caffeine. In fact, no more Tiramisu either. If you have to have do something with coffee in its name, put your feet on your coffee table and sip some water with Coffee Flower Essence in it. In a word, CHILL. 3. A reminder about your anatomy. Contrary to what you think, you do not have eight arms. For clarity about your real anatomy its time for more Amaryllis Flower Essence. 4. So over the winter, you saved a lot of cardboard boxes that could be used to mulch new terrain and make new gardens. This does not mean they NEED to be used to make new gardens. Not every inch of your 18 1/2 acres needs to be a garden. Sip some Alignment Garden Essence whenever you get the itch to spread vast new terrain with cardboard and mulch. And yes, I know you are writing this blog right after you have mulched a whole new garden area. 5. Just because you see a job that you think needs to be done, it does not mean you need to do it today or even this season. Really. Take it from the Roses, F J Grootendorst Rose and the Fairy Rose Essence for example, spring IS also a time for PLAY. 6. Ask for help. You don’t need to move the entire mulch pile, manure pile, and compost pile by yourself. It’s called SPRING VACATION and Will and Jim are having one next week. Emily too. She’s home for her second spring break next week. Tell her manure hauling is much like lifting weights in her college’s fancy gym and accomplishes the same thing. She will get over the smell. Remind yourself that you may not have eight arms, but between the four of you, you do. Cosmos Flower Essence will help you speak up. 7. When it is too dark to see your fingers and too cold to feel them, it was time to call it a day two hours ago. Take your Day Lily Flower Essence to know when its time to call it a day and remember, life is better with all ten fingers, so lay off the pruning at dusk.